Today is my Husby’s birthday! When T realized that her dad’s special day was coming up, she demanded that we make him a “Blue’s Clues cake.” I suppose she remembered how happy it made HER to have such a confectionery delight at her own birthday party, and she wanted to spread the love! Cute! Only, Puff’s dad is weird – and he doesn’t really like cake. He gets pumpkin pie (or cheesecake – or both!) on his birthday, instead. . . But Puff wasn’t about to let a tiny detail like pie vs cake get in her way! 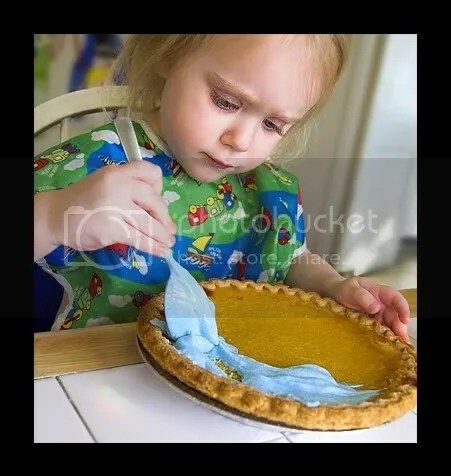 She iced with food-colored blue whipped cream. 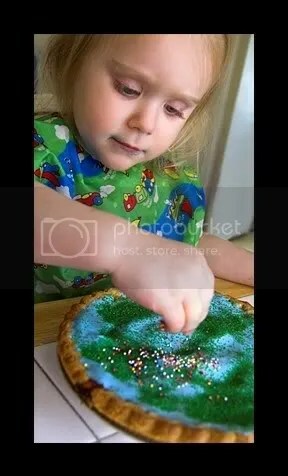 . .
Then went nuts with the green and rainbow sprinkles. 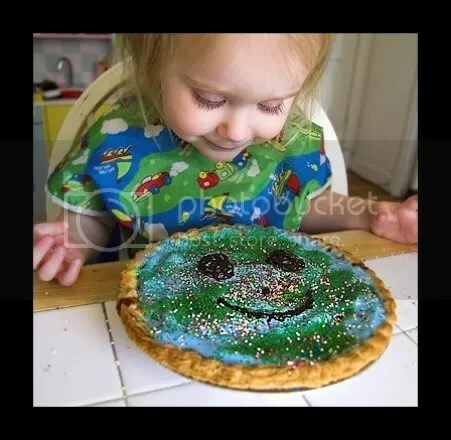 . . and made me ‘help’ her make a smiley face on it as a finishing touch, before drooling all over it until daddy came home from work! Next she wanted to make him a card. So we did! What Husby wanted for his birthday more than anything was a laptop. And he’s gonna get it! Thanks to all of our family, friends, and co-workers who donated to his cause, his birthday wish will come true! (You guys are AWESOME! We wouldn’t have been able to do this without all of your help!) But. . . he’s going to have to wait for just a little bit longer, as we figure out how much he has to spend and then orders it and all of that nonsense. 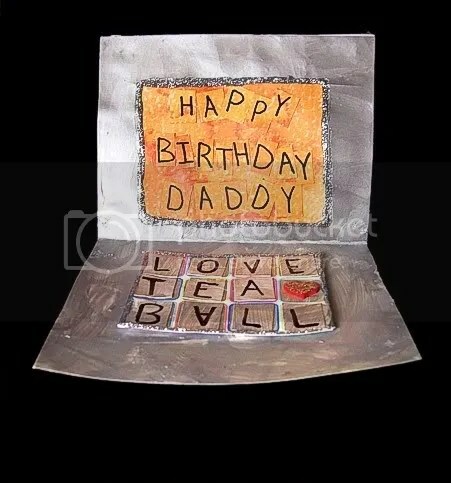 So I decided that we could make him a laptop birthday card! And we did! Obviously, I helped with this one quite a bit, but Puff did a fantastic job on her end. 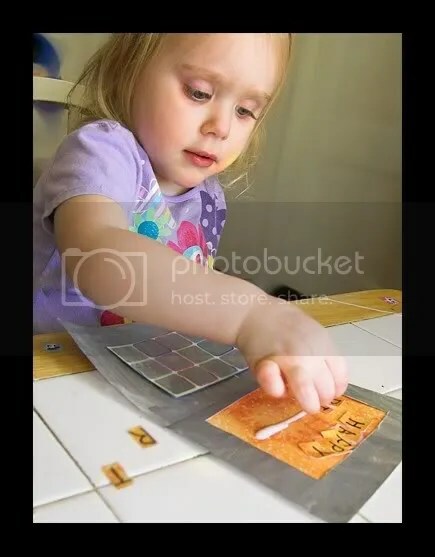 She found all the letters (and the heart) as I called them out, and glued them in the order that I told her – automatically running them from left to right. I’m so proud of my smarty-pants girl! A funny thing about this was that she glued EVERY SINGLE LETTER A on upside-down! I pointed the error out to her and she fixed them – except the last one. I decided not to mention that one, because I thought it was cute and wanted to preserve the adorability!! Puff REALLY wanted to sprinkle the card with pink glitter, but her dad HATES the stuff, so I managed to talk her out of it. 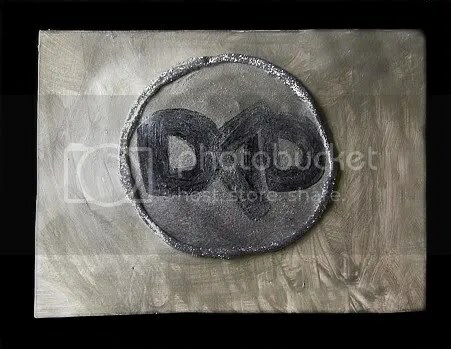 As a compromise, I used silver glittery fabric paint. Husby couldn’t be upset about that because the glitter doesn’t sprinkle everywhere. Puff couldn’t be upset about it because it was sparkly. Everyone was happy! Finally I *attempted* to make a Dell-esque logo for the front of the card, only it says ‘Dad’ instead. . . I *think* this looks better in person, though its a far cry from perfect. The silver reflections that my camera picked up makes it look even weirder on ‘film,’ but you get the idea! And, of course, the SECOND her dad walked in from his day at work, T was ready for some pie! 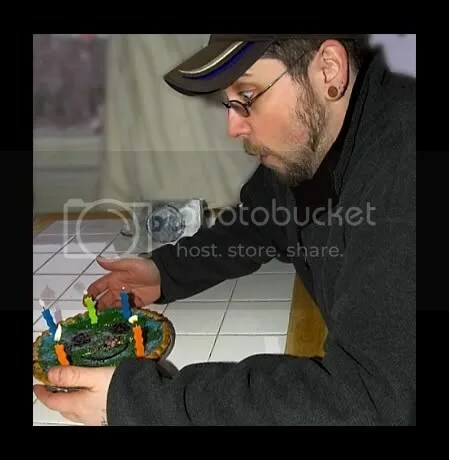 So we I sang the birthday song, and good ol’ Paparoonie blew out his candles. . . all 5 of them. 3 on top and 2 on bottom. Because Husby is turned 32 today. T got all boggled by the fact that her dad has 2 numbers in his age! ‘s a tough concept to wrap such a little mind around – she can only count to 13, and to her, that’s like. . .infinity plus 1! So cute! Happy birthday to the Daddy of the house! Looks like you guys had a great day! Awww!! Happy Birthday to Husby!!! I love how he actually is expressing “suprise!” Such a feat for him, I know. 😉 The card is perfect! I love it. 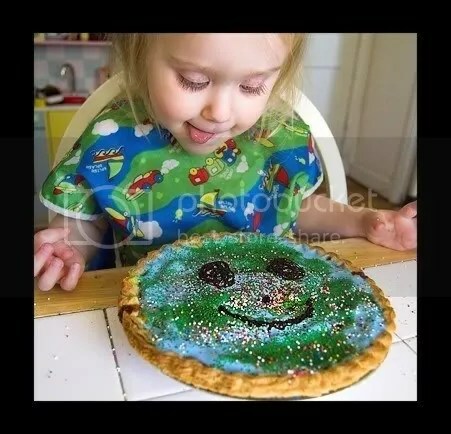 I think his pie looks like the world with a happy face on it. TOO cute!! Did he eat a piece?? I have to know! What a cute idea for a “blues” cake. How nice of her to think of others. T is not only a smart cookie, but she’s compassionate too. Wonderful! Happy Birthday to you, too, Husby! Hope you had a wonderful day. I read this in a rush, before commenting, but I’m back. Your husband sounds like a great father, and boy or girl, adding another child to love and be loved by in your home is a blessing. Blue’s Clues will NEVER go outta style – at least not around here! Thanks for mentioning that, I just realized that I forgot to put the link back to her 2nd birthday in! Thank GOD I didn’t have to do it twice! I made my husband do the cake icing, because I got so nervous just thinking about it! He did a great job, though. . .
And you’re right – he is a great father! Either flavor kiddo is fine with me. . .I just wish I KNEW! Happy Belated Birthday, Father Figure of the Teaball!